It’s too damn loud. It might be fine if I were placed it at one end of a football stadium and ran a really long lead to the other end but in my house it rattles the windows as soon as the master volume is turned above two. I’d learned to live with it but always felt like I couldn’t push it enough to get it really cooking. Apparently, I’m not alone. Thanks to Gary, I found out that there’s a whole community of loud Deluxe sufferers. And, it turns out it’s an easy fix. Why is my Blues Deluxe so damn loud? 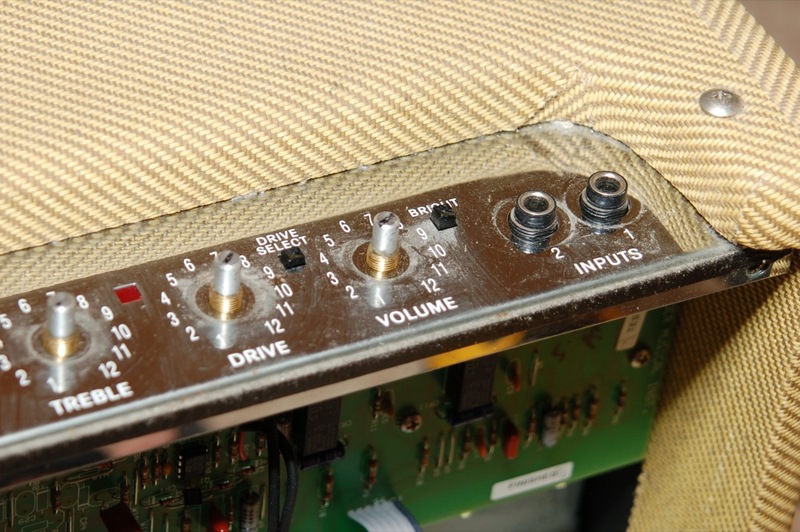 It seems that Fender, for whatever reason, installed a linear-taper potentiometer in the Master Volume position. Trying to stay on the right side of geeky here. 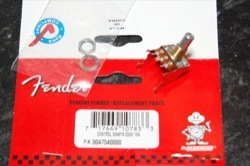 A potentiometer (or pot) is a variable resistor. 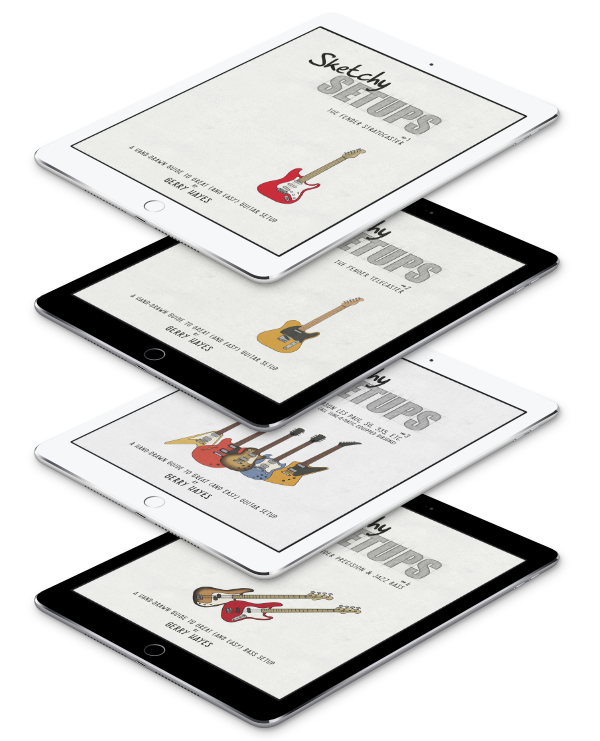 They’re the things used in the volume and tone controls of your guitars and amps. There are two types of pots used in these things. A linear-taper and a logarithmic (log or audio) taper. 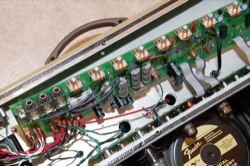 The taper determines the resistance at any point in the rotation as you turn the volume or tone knob. This determines how much of an effect the control has. With a linear taper, one tenth of a turn equals one tenth of the pot’s resistance. Two tenths of a turn is two tenths resistance, and so on. This all sounds fine but the problem is our brains do not perceive sound in a linear fashion. It’s all to do with decibels and stuff but a linear increase in volume isn’t good for our ears and brains. So then, this is where the log or audio taper pot comes in. With a log taper, one tenth of a turn doesn’t necessarily equal one tenth of the pot’s resistance. Instead, the resistance varies slowly at first and then curves to have more effect as the control is rotated towards maximum. The result sounds much more natural to our crazy human heads. The linear taper on the Blues Deluxe’s master volume bring masses of volume in very quickly instead of the gentle curve of an alternative, audio taper pot. We’re going to swap out the linear pot with a log/audio pot in the master volume position. No fooling here. This can be VERY dangerous. 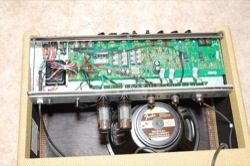 The inside of your amp contains enough potential voltage to seriously hurt or even kill you. Even when it’s switched off and unplugged, the capacitors can store potentially lethal charges. I DO NOT ACCEPT ANY RESPONSIBILITY if you hurt yourself or damage your equipment in any fashion. If you’re not completely confident to carry out these steps without risk, DO NOT DO IT. 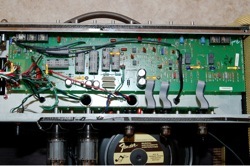 Have an amp tech do so or ask around to see if one of your friends is competent enough that you trust him/her to do it. 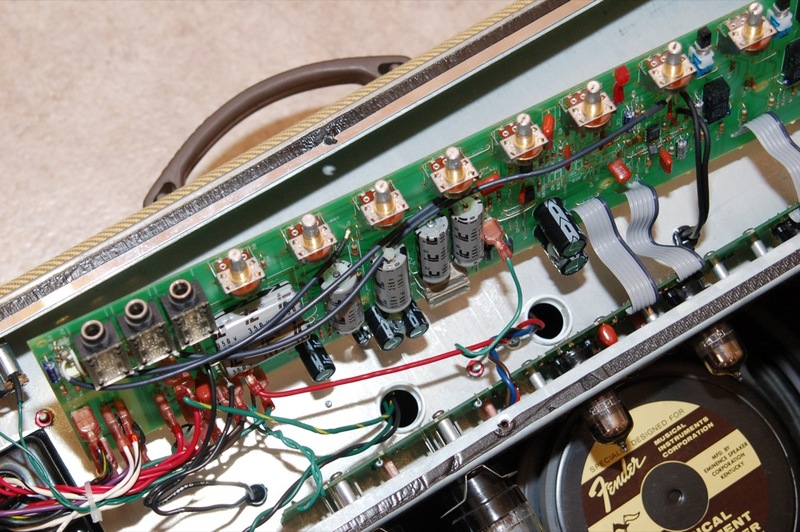 This is worth repeating: Do NOT even open your amp if you are not completely sure you know what you are doing. If you’re certain that you have the knowledge and confidence to work safely, then I won’t have to tell you (but I will anyway) to ensure your amp is switched off AND unplugged from the power outlet. If you can, unplug it and leave it a few days to allow the capacitors to discharge (this doesn’t guarantee they’ll discharge but it’s not a bad idea to do anyway). It’s a good idea to have someone nearby just in case there are any emergencies but make sure you’re giving the project your full attention and not chatting with them. First off, you need to order yourself up a replacement pot. I got mine at Tubes And More Antique Electronic Supply but I’m certain you can get one in other places. 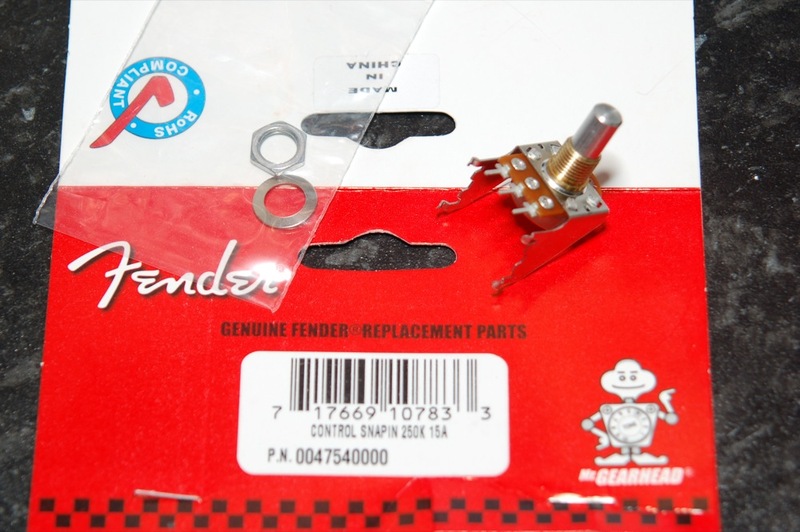 Pop over to their site and search for (their) part number R-VHD-250KA (Fender part number 0047540000). Wait for it to arrive (maybe unplug your amp while you’re waiting). 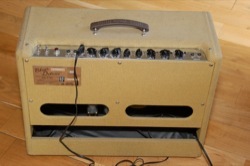 Turn your amp around and vacuum out any spiders living in the cabinet. Seriously, there was one in mine the size of a dinner plate. Remove the six screws holding on the rear panel. Place the screws in a bowl so you don’t lose them. 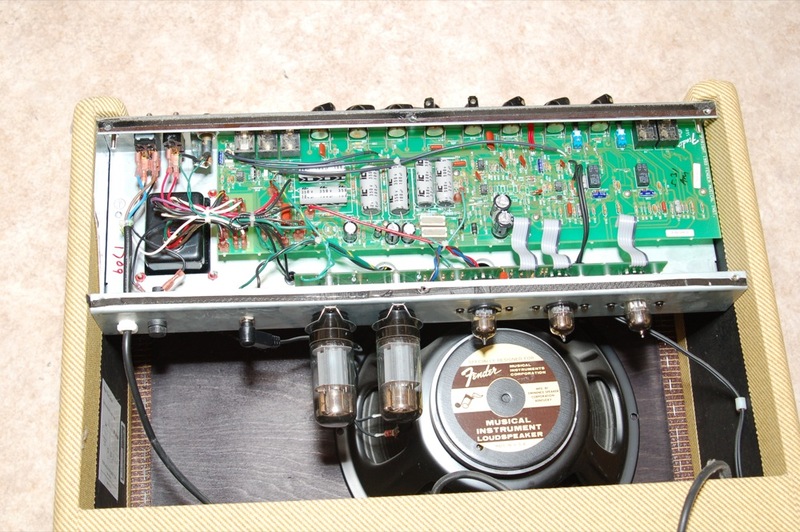 You’ll expose the internals of the amp pretty easily by removing this rear panel. We need to get to the other side of that PCB (printed circuit board). 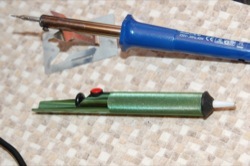 Using a small, flat bladed screwdriver, loosen the small grub-screws holding the chicken head knobs on the pot shafts. Pop the knobs beside your bowl. 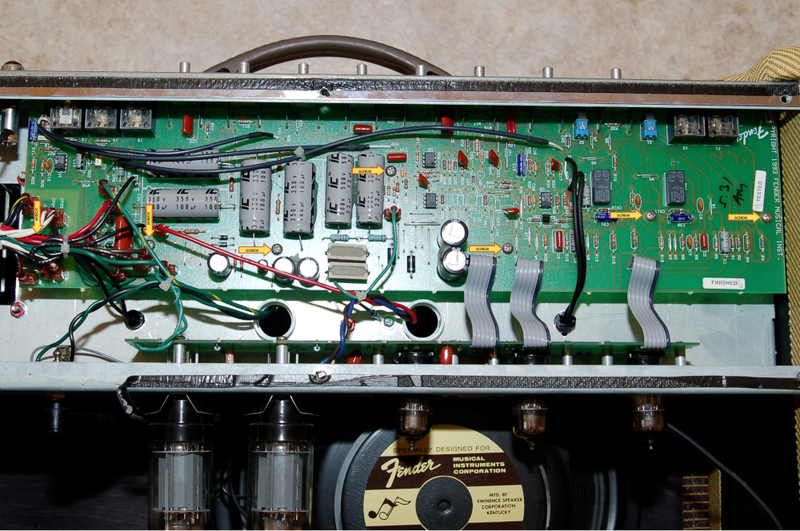 Now we need to remove the nuts and washers holding the control pots, the input jacks and the footswitch/pre/power-amp jacks to the faceplate. Put all of these in your bowl. 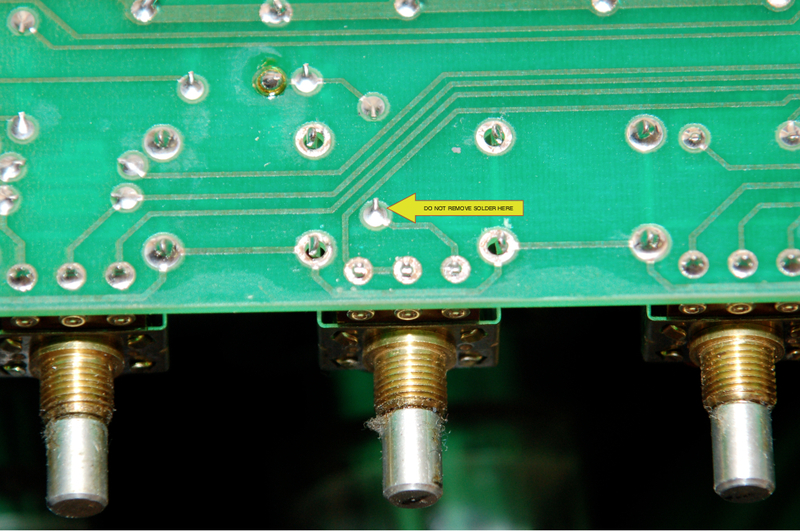 There are seven philips screws holding the PCB to its mounting. Their location is noted in the photo above. When you’re sure the PCB is free, gently shift it downwards. We need to flip it over so we have to have the jack sockets and control pots free of their mounting. You might need to clip the cable-ties on one or two wiring looms to get sufficient slack to allow this. Be careful—don’t cut the wires. Once it’s flipped over we can access the solder joints for the master volume pot. Make sure you pick the right one by the way. Count from the left to ensure you’ve identified the master volume. 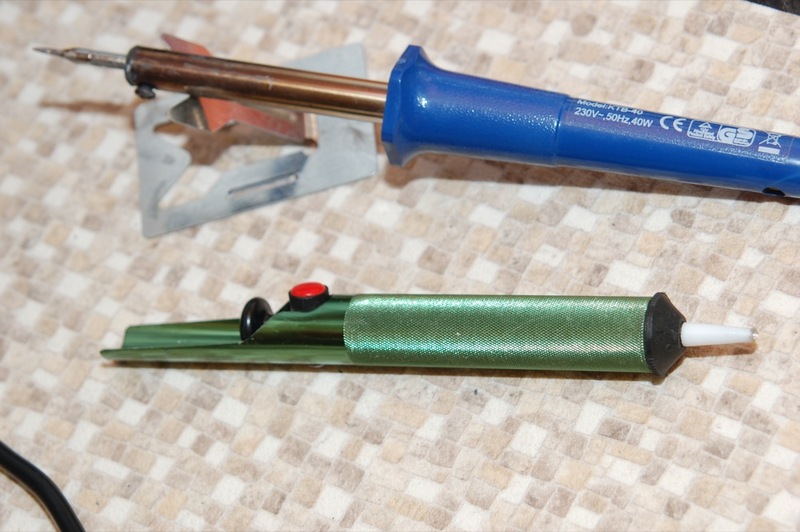 Use a desoldering pump and a hot iron to remove the solder joints from the four mounting lugs and the three control lugs. 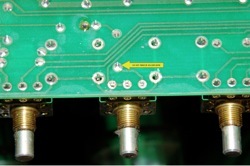 DO NOT remove the solder from the point in the middle (see the photo). I’m not going to tell you how to solder and desolder here—if you don’t know, you have no right messing about inside an amp. Remove the original master volume pot and insert the new one. Solder the mounting lugs first and then the control lugs. Make sure you get good shiny joints—use an appropriately powered iron. That’s it. Reassemble by reversing the steps above (replacing the spider is optional). This is a pretty easy mod and it makes a big difference to the amps usability. If you’ve got a Blues Deluxe, I definitely recommend it. It probably took longer to write this article than it did to do the work but the caveat above remains—DON’T DO THIS if you’re not 100% sure you can do so safely.